Für diejenigen, die Firmengründer Virgilio fragten, welcher der von ihm bevorzugte Wein sei, antwortete er ohne zu zögern: „Der Syrah, für immer.“ Sein stark limitierter Tua Rita Syrah Per Sempre (dt. : für immer) entstand durch seine Lust am Experimentieren. Erst nach vielen Jahren befand er die Syrah-Reben für soweit, um daraus diesen Wein zu erzeugen, der mit dem Jahrgang 2001 das Licht der Welt erblickte. Auf den mineralischen der nördlichen Maremma gewachsen und 20-22 Monate in neuen Barriques aus französischer Eiche gereift, zeigt der Wein eine Eleganz wie man sie sonst nur im Bordeaux findet. The 2013 Syrah Per Sempre is another gorgeous wine from Tua Rita. This estate on the Tuscan Coast offers one of Italy's top Syrahs. In vintages like this, it is in the running for the number one spot among Italian expressions of the Rhône grape. It opens to supremely finessed varietal characteristics of blackberry, chocolate, toasted espresso, smoked bacon and dark spice. The wine is aged in barrique for 21 months and no clarification is performed. In warmer vintages with early-ripening fruit, you risk that the muscular structure of the wine eventually overcomes the bouquet. This is not the case in 2013. The wine presents power and generosity in equal fashion across the senses. This wine was not produced in 2014 because the grape skins were damaged that year. Hold onto your bottles of 2013, because you need to make it last. 97/100 Punkte falstaff: Funkelndes Rubin-Violett. Duftet intensiv nach Wald und Zedernholz, dann dunkle Holunderbeeren, fleischig, satte Gewürztöne. Am Gaumen viel feinmaschiges Tannin, wie aus einem Guss, strömt kompakt dahin, überaus lange und dicht, salzig, zum Reinknien! 95+/100 Punkte Vinous - Antonio Galloni: I have tasted the 2013 Sirah Per Sempre several times over the last few months and it just keeps getting better. 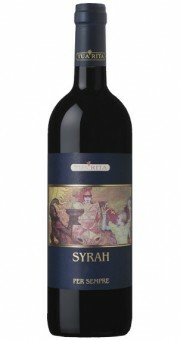 Intensely aromatic, Tua Rita's Syrah is unusual for the Tuscan coast because of its distinctly floral/savory personality. Sweet tobacco, rose petal, sage, mint, wild flowers and red-fleshed fruit are some of the signatures. In the 2013 Sirah readers will find a wine endowed with tons of nuance and complexity. A final kick of aromatics married to rich Suvereto fruit leaves a lasting impression on the finish. Just bottled, the 2013 is quite raw and in need of time, but it is incredibly promising, not to mention delicious. 95/100 Punkte James Suckling: Wonderful dried meat, spice, dried herb and earth character topped off with ripe fruit. It’s elegant and racy with great length and structure, yet also refined and gorgeous. So drinkable now. The Hermitage La Chapelle of Italy. Pure Syrah. 93/100 Punkte Wine Spectator: A meaty red, boasting blackberry, plum, black olive, smoke and vanilla aromas and flavors. Rich and dense, with a lingering aftertaste of herbs and oak spice. Drink now through 2023. 200 cases made.